After I had an awesome time climbing Taal Volcano, I left the Taal Lake Yacht Club in a pedicab and reached a Jeepney Station. I had wanted to visit Picnic Grove in Tagaytay City and the jeepney was the most suitable mode of transportation to get me there. Believe it or not, I did not take any photos of jeepneys even though so many of them passed me by while I was walking the streets of Manila! I really do not know why! 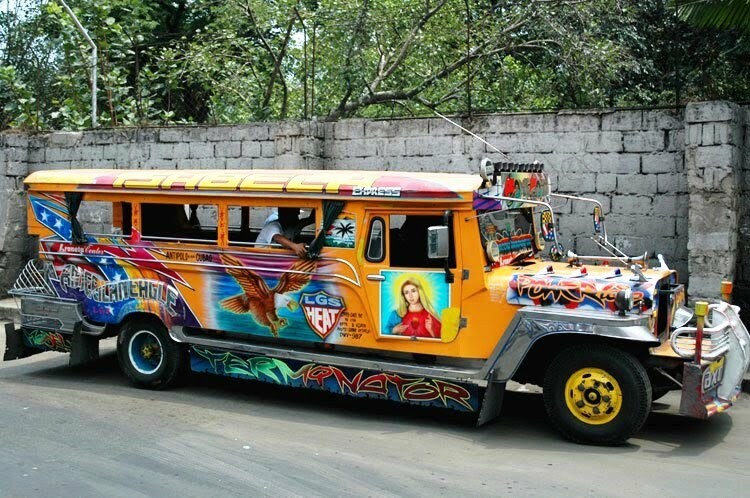 Anyway, here is a photo of a nice looking jeepney I found online. 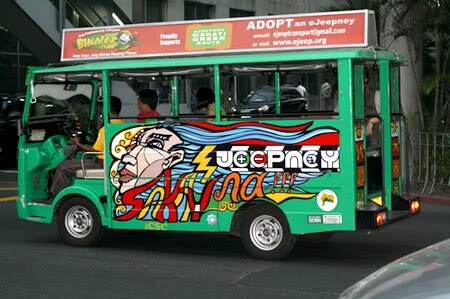 Is that an awesome looking jeepney or what? I just love the flamboyant decoration or paintings! And guess what? I have yet to see two jeepneys with the exact same paintings! Now although I love the appearances of a jeepney, I hate sitting in one! That's right. Jeepney is the cheapest (if you don't count the pedicab) and most popular mode of public transportation in the Philippines. But you know what? I rather take the taxi! Haha! Originally made from US military jeeps left over from World War II, jeepneys have become a symbol of Philippine culture. You can flag down a jeepney like you flag down a taxi and the driver can stop anywhere upon the passenger's request as long as it's along the planned route. The thing I don't like about the jeepney is that it takes in passengers even though it's already packed like sardines and there are hardly any places left to sit! By the way, as a passenger, you can only enter the jeepney from the back. And since I am a tourist there, I chose to sit nearest to the driver in front so that I could communicate with him. Bad move! I ended up helping to collect the fare from passengers and passing them to the driver since I was the one sitting right behind the driver! And when the driver returned the change, guess who had to pass the money to the passengers? 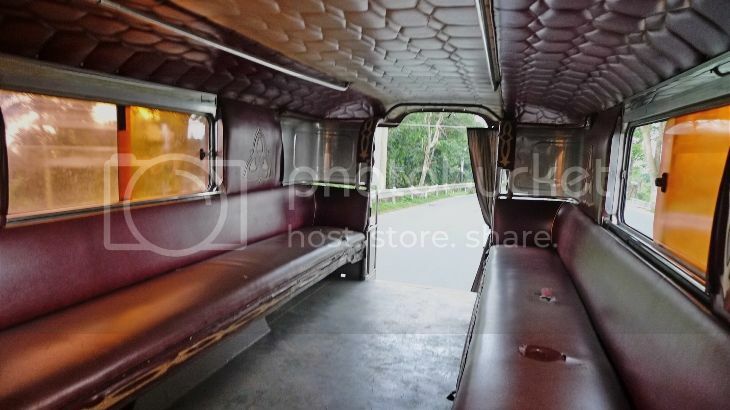 This is how the interior of the jeepney which I sat on my way to Picnic Grove looks like. 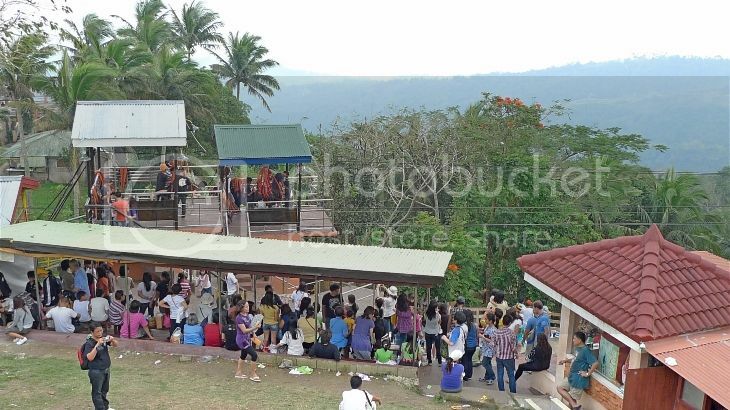 I took this photo after all the passengers left for a daytime market in Tagaytay. I was the only one going to Picnic Grove. As you can see, it would be quite impossible for passengers sitting at the back to pay their fares. As such, they would need the help of adjacent passengers to pass their money to the driver. Of course since I was seated right behind the driver, I ended up receiving most of the money from the passengers and doing the voluntary work of handing them to the driver. Oh well, that was quite a unique experience. I can't imagine doing the same thing in a bus in Malaysia! LOL! And guess h0w you stop the driver when you reach your destination? There are many ways to do it and most of them just called out to the driver to stop. But I noticed some simply knocked on the roof of the jeepney and the driver would stop for them! By the time I reached Picnic Grove, it was already 3pm. 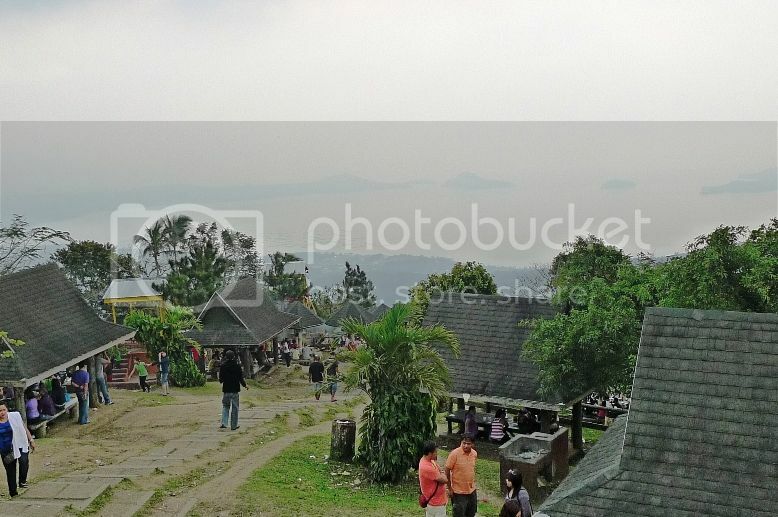 I have to say the weather was cooler and certainly more pleasant in Tagaytay than in Manila. 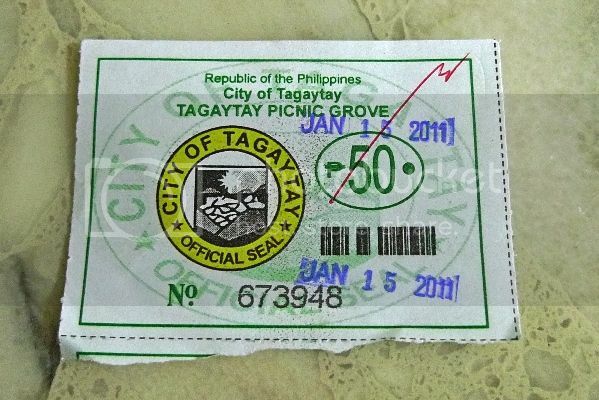 The entrance fee to Picnic Grove was 50 pesos (RM3.50) per person. There were quite a number of attractions at Picnic Grove. One of them was horseback riding which costs about 200 pesos (RM14) per hour. I did not take any photos of the horseback riding as there were quite a lot of people there! 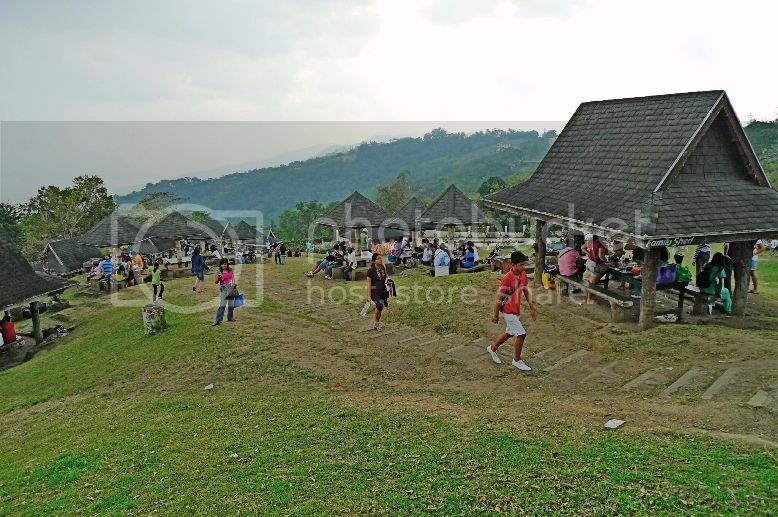 I learnt that a lot of Filipinos like to visit Picnic Grove during the weekends, hence the big crowds! 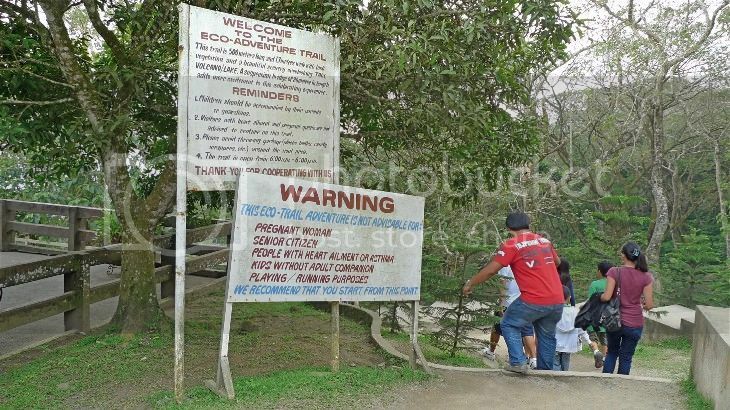 Walking further along, I saw this signboard welcoming visitors to the eco-adventure trail. Here's the magnified image of the signboard. 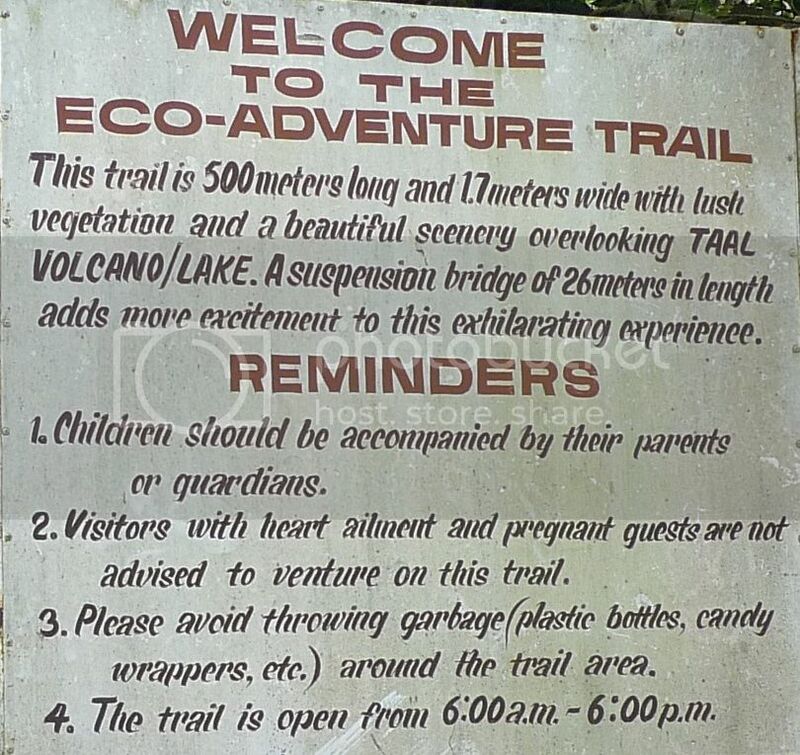 I thought the warning or reminders were a bit too extreme as I found the eco-trail nothing much to shout about. Perhaps I have been to places like FRIM in Malaysia and I was used to such nature walk? 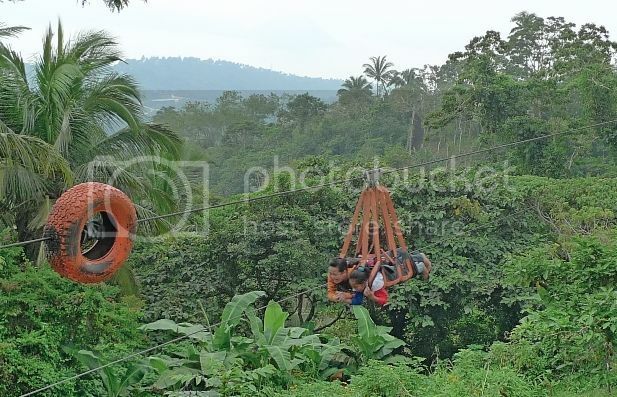 The most exciting activity in Picnic Grove has to be the Tagaytay Ridge Zipline! 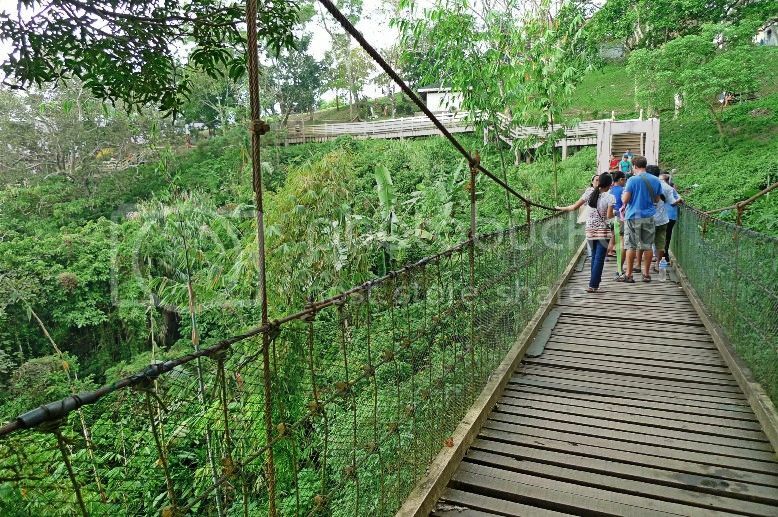 This involves soaring above mountains and the magnificent Taal Lake with just a security rope tied to the zipline. I have a fear of heights and this would certainly be the last thing I wanted to do! But I knew I just had to do it! Looking at the queue however puts me off! But I was determined to do it. First however, I decided to observe how they "flew". It sure looked scary to me. I was wondering if that zipline was as secure as I would like it to be. But everyone just seemed to enjoy it. Although there were some who screamed their lungs out. That was not too encouraging! I was thinking perhaps I should just sit in the cable car instead. The cable car was something like a bird cage (photo below left) and looked so much more safer to me! Then I got to know another lone tourist (from Australia) and after some discussion, we both decided to give this zipline thing a shot! Although I must say I was way more nervous than him! LOL! OK, no photos of both of us "flying" at up to 60 km per hour and soaring 300 feet off the ground over hills and mountains but "flew" we did! Gosh! The moment we were up in the sky seeing the majestic Taal Lake in the distance was an experience I would not easily forget! I was glad I survived it! Phew!! 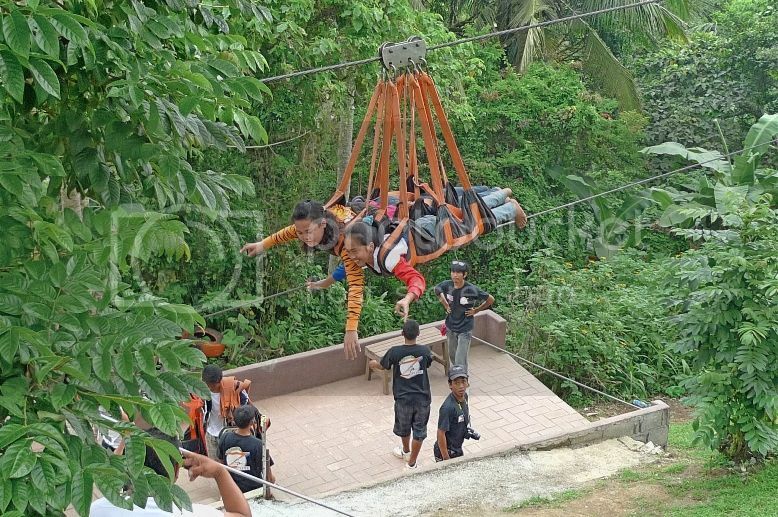 It costs me 300 pesos (RM21) for a one way ride across the zipline. A two-way ride would be 400 pesos (RM28) and I should have taken that but I was afraid I might not enjoy the ride so better just take one way to be safe! Haha!! It would however be cheaper during weekdays - only 200 pesos (RM14) one way or 300 pesos (RM21) both ways. 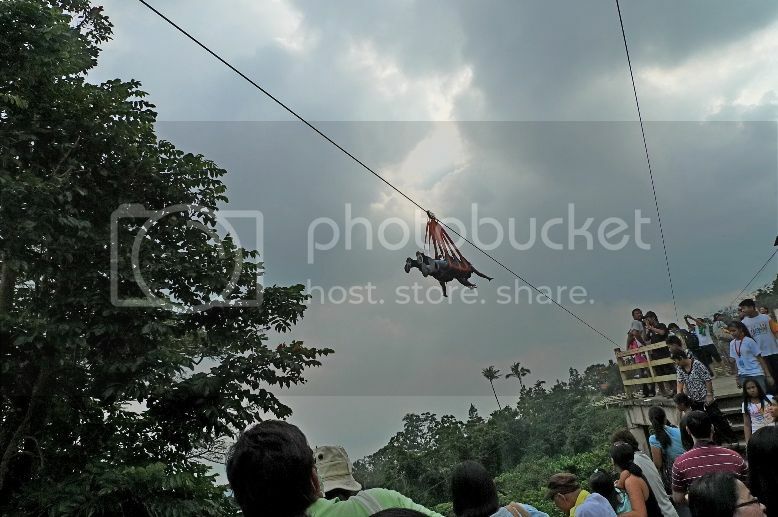 So if you plan to visit Picnic Grove and ride this zipline, do go during the weekdays. Not only do you avoid the crowds, you also get to ride for a much cheaper price! 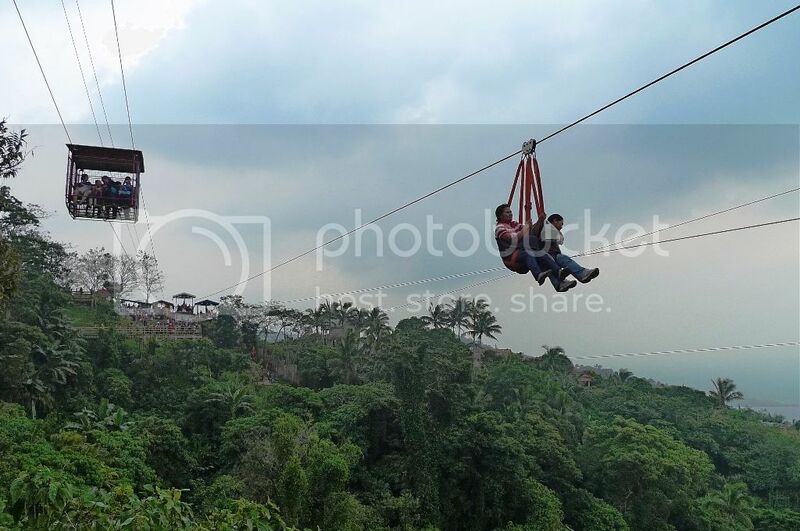 For more details of this Tagaytay Ridge Zipline facility, read HERE. After all that excitement, I spent some time back safely on the ground walking the eco-trail. 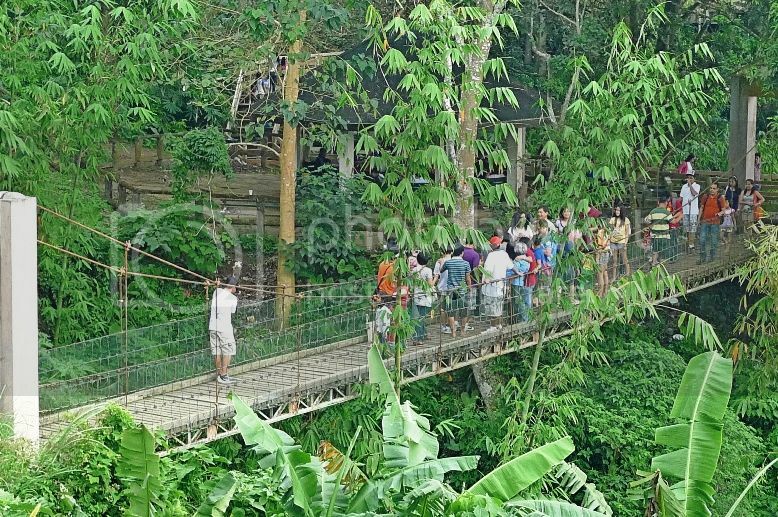 This is the suspension bridge I got to cross. OK, nothing much to shout about here. The greeneries and forests surrounding the area however, was nice and calming in the cool air. I tried to capture the majestic Taal Lake from this place but I found the air too foggy that evening. So my photos did not come out clear. There were a lot of people having picnic in the park. Most were sitting inside covered huts overlooking Taal Lake. Overall, I was not too impressed with Picnic Grove. If it was not for the cool air and the Zipline, I do not think it's worthwhile coming all the way from Manila City! 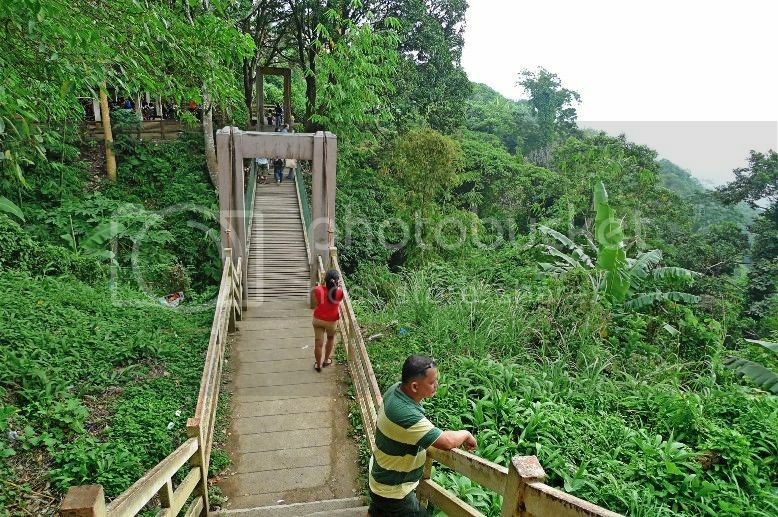 But if you are dropping by Picnic Grove as part of your tour of Tagaytay City and the nearby Taal Volcano, then I guess it's OK. It was close to 5pm and knowing the traffic jam in Manila, I hurried to take a jeepney to the Olivares Bus Station, where I got onto a bus heading to Pasay Bus Station in Manila. But it was too late! It started to rain and I was trapped in one of the most nightmarish jam from Tagaytay to Manila. Instead of 2 hours, the journey took me more than 3 hours! Even worse, after alighting from the bus, I could find no taxi to take me back to my hotel! I walked around and ended up having dinner at ChowKing. 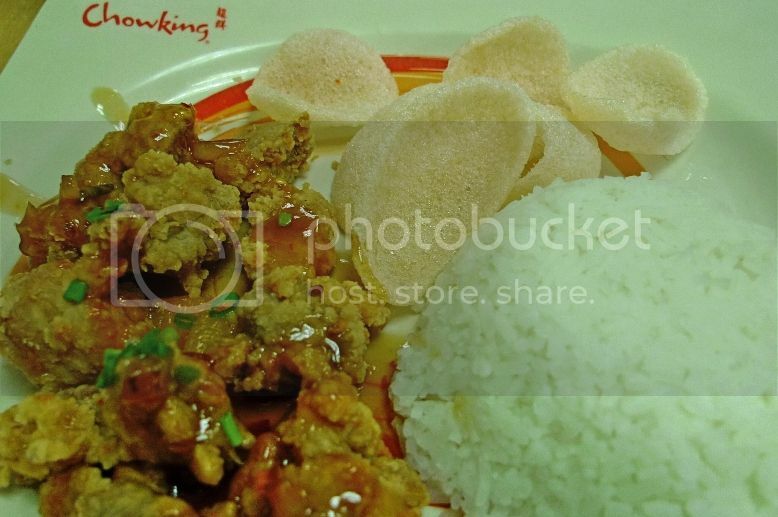 ChowKing is a fast food restaurant serving Chinese food like noodles, dim sum and rice dishes. I ordered rice with chicken in sweet and sour sauce. Being a Chinese, I did not find the food particularly good, but I guess I could not complain much as this was just a fast food outlet. After dinner, it was still raining and the traffic jam was still very bad. I walked to the nearest McDonalds and waited it out with a McD sundae. It was only after 10pm that I finally managed to get a taxi back to my hotel. I was so tired I immediately went to sleep after my bath. I was looking forward to the next day, where for the very first time, I would be meeting up with a Filipino blogger from Manila itself. I could hardly wait! Farewell To Rizal Park, Wham! Burger And Manila!